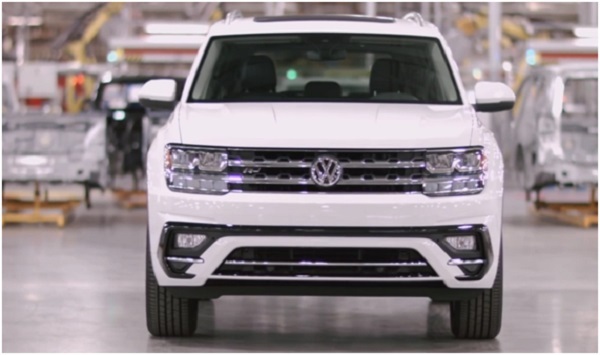 The new Volkswagen Atlas 2017-2018 — the first news, price, photo and video, complete sets and technical specifications Volkswagen Atlas, a 7-seat SUV designed for America, Russia and the Middle East. 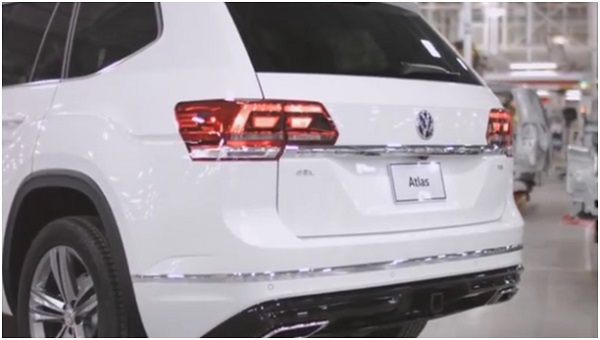 The world premiere of the new Volkswagen SUV with the original name Atlas took place on October 27, 2016 in California. The production of the new car will be already established at the factory in Chattanooga (Tennessee USA) until the end of the current one. Sales of the new 5-meter giant, equipped with gasoline engines 2.0 TSI (238 hp) and 3.6 VR6 (280 hp), will start in the US market in the spring of 2017 at a price of $ 40,000. Before the Russian motorists, Atlas will make it to the end of next year. At the very beginning of the review we want to clarify the name of the novelty. It was assumed that the new seven-seater crossover from the German company Volkswagen, built on the modern modular platform MQB, will receive a name for the letter «T», similar to the rest of the models of the crossover line Volkswagen — Tiguan and Touareg. Even the original and logical name appeared — Teramont. But the leadership and marketers of the German automotive giant chose Atlas. Perhaps in China the novelty will be offered as Volkswagen Teramont. 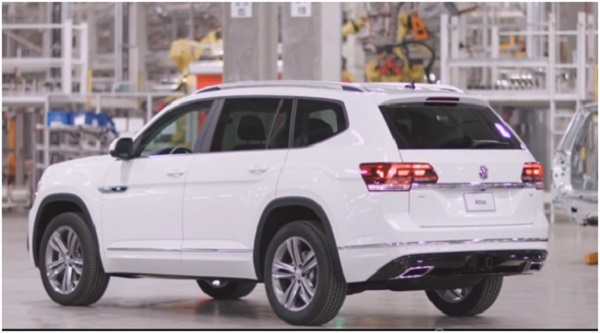 The new Volkswagen Atlas in the ranks table will be located between Volkswagen Tiguan and the new generation Volkswagen Touareg, which is scheduled for release in April 2017. The exterior design of the body of the large 7-seat crossover Atlas is decided in the style of the Volkswagen Cross Blue Concept prototype, presented in 2013 as part of the Detroit auto show. It is interesting that the new Volkswagen SUV is in many respects similar to the Czech crossover Skoda Kodiaq — the general MQB platform, the 7-seat configuration of the interior, a strict and sedate appearance, a solid set of modern equipment. But the German novelty is much larger than the Czech crossover. 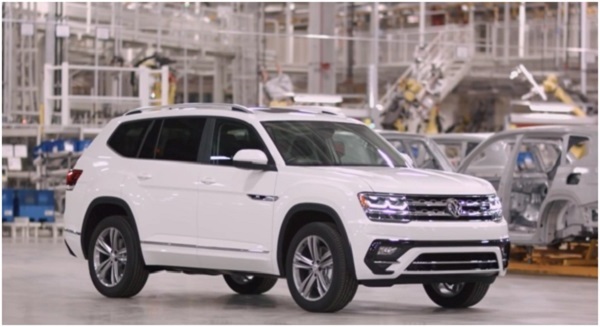 The exterior dimensions of the body of the Volkswagen Atlas 2017-2018 are an impressive 5037 mm in length, 1979 mm in width, 1768 mm in height, with a 2,980 mm wheelbase. Depending on the engine installed, the level of equipment and the owner’s desire, the SUV is equipped with large 18-20-inch alloy wheels with rubber from 245/60 R18 and 255/55 R19, up to 255/50 R20. Stylish body of a large German SUV bribes with clean and laconic lines, classic proportions with adjusted details. There are fully LED headlights with an original pattern of daytime running lights and LED parking lights with three-dimensional graphics. Seven-seater salon novelties solved in a traditional German style. The strict design and laconism of the lines, high ergonomics, high-quality materials and rich equipment. There is a virtual instrument panel with a 12.3-inch screen, called the Volkswagen Digital Cockpit, the latest multimedia system with a 9.2-inch color touchscreen (Apple CarPlay, Android Auto, MirrorLink, satellite navigation, rear-view camera or panoramic view system) , A 480-watt Fender speaker system with twelve speakers, an electric front seats, heated and front seat seats and second-row seats, three-zone climate control, Adaptive Cruise Control, Forward Collision Warning and Autonomous Emergency Braking, a Blind Spot Monitor with Rear Traffic Alert, Lane Departure Warning and Park Assist. The Automatic Post-Collision Braking System is standard equipment and helps to minimize possible damage to the driver and passengers in a frontal collision. 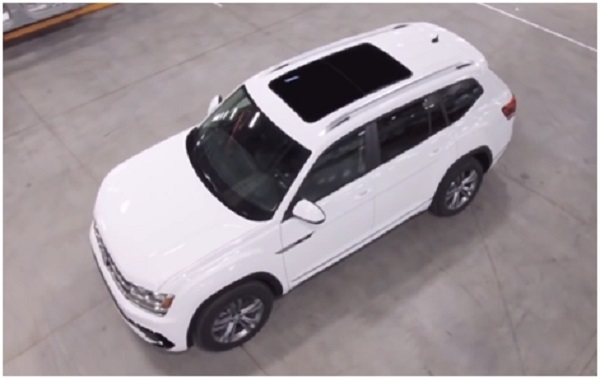 Technical characteristics of Volkswagen Atlas 2017-2018. For a large SUV, two gasoline engines, working in tandem with 8 automatic transmissions, are stored. The initial turbocharged four-cylinder 2.0-liter TSI (238 hp) combined with a drive to the front wheels. The more powerful 3.6-liter VR6 (280 hp) goes to the company with the all-wheel drive 4Motion. It’s unfortunate only that the VR6 engine is quite old, it’s already 11 years old, and it’s easy to forget about the fuel efficiency with this engine.